14173.pdf - Pages: 283 - NEETS, Module 1, Introduction to Matter, Energy, and Direct Current - Presents information on matter make up and behavior of matter, magnetism, methods of producing electricity, and direct current problem solving. Topic 1 presents information on matter, energy, electricity, and symbology. Topic 2 discusses batteries. Included are discussions on the battery cell, chemical processes, polarization, uses, and safety precautions. Topic 3 introduces direct current circuits and explains many of the formulas that are used routinely in electricity. 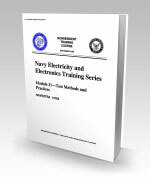 14174.pdf - Pages: 250 - NEETS, Module 2, Introduction to Alternating Current and Transformers - Introduces alternating current theory and power supplies. Topic 1 discusses the differences between alternating and direct current, magnetism, generation of alternating current, and characteristics of sine waves. Topic 2 introduces inductance characteristics, such as electromotive force, self inductance, and mutual inductance. Topic 3 introduces capacitance. Discussions are presented on the electrostatic field, capacitor characteristics, and series and parallel capacitive circuits. Topic 4 presents information on inductive and capacitive reactance, power in reactive circuits, and power factors. Topic 5 describes transformer characteristics. 14175.pdf - Pages: 214 - NEETS, Module 3, Introduction to Circuit Protection, Control, and Measurement - Presents information on circuit measurements, circuit protection devices, and circuit control devices. Topic 1 discusses basic ohmmeters, ammeters, voltmeters, wattmeters, and frequency meters. Topic 2 discusses circuit protection devices, such as fuses and circuit breakers. Topic 3 discusses switches, solenoids, and relays. 14176.pdf - Pages: 152 - NEETS, Module 4, Introduction to Electrical Conductors, Wiring Techniques, and Schematic Reading - Introduces electrical conductors, wiring techniques, and schematics. Topic 1 covers wire characteristics and insulation. Topic 2 covers conductor wiring techniques, including splicing, soldering, and lacing. Topic 3 covers schematic reading, marking systems, and some basic safety practices and precautions. 14177.pdf - Pages: 120 - NEETS, Module 5, Introduction to Generators and Motors - Covers basic construction and theory of operation of AC & DC generators and motors. 14178.pdf - Pages: 204 - NEETS, Module 6, Introduction to Electronic Emission, Tubes, and Power Supplies - Presents an introduction to the theory of electronic emission and electron tubes. Topic 1 covers the construction, function, and theory of operation of the diode, triode, tetrode, and pentode. Topic 2 presents special-purpose tubes. The basic vacuum-tube power supply, including voltage and current regulation, and the methods used to isolate faulty components are covered in Topic 3. 14179.pdf - Pages: 287 - NEETS, Module 7, Introduction to Solid State Devices and Power Supplies - Deals with solid-state devices and power supplies on a basic level. It presents a basic discussion of electron and hole flow in semiconductor devices and explains the construction, function, and theory of operation of the transistor. Also covered are the purpose modular circuitry and the advantages of integrated circuits over conventional transistor circuits, and the construction and use of the other solid-state devices such as the Zener diode, tunnel diode, varactor, silicontrolled rectifier, triac, unijunction transistor, and the more commonly used opto-electric devices. Fundamentals of solid-state power supplies are also covered. 14180.pdf - Pages: 186 - NEETS, Module 8, Introduction to Amplifiers - Presents an introduction to what amplification is and how different types and classes of amplifiers affect amplification. Topic 1 discusses audio amplifiers. Topic 2 discusses video amplifiers and radio frequency amplifiers. Topic 3 presents differential, operational, and magnetic amplifiers. Factors which affect how an amplifier performs, such as impedance, feedback frequency response, and coupling, are also explained. 14181.pdf - Pages: 275 - NEETS, Module 9, Introduction to Wave-Generation, and Wave-Shaping Circuits - Introduces electronic wave-generating and wave-shaping circuits. Topic 1 discusses tuned circuits, resonance, resonant circuits, filter circuits, bandwidth, and special safety precautions to be observed when repairing tuned circuits. Topic 2 presents fundamental oscillator theory, including circuit configuration and frequency and amplitude stability of circuits. Topic 3 presents various waveforms, and waveform-generating circuits such as multivibrators, blocking oscillators, and time-based generators. Topic 4 describes limiters, clampers, differentiators, integrators, and counters. 14182.pdf - Pages: 276 - NEETS, Module 10, Introduction to Wave Propagation, Transmission Lines, and Antennas - Introduces wave propagation, transmission lines, and antenna theory. Topic 1 discusses wave motion, sound-wave terminology, light waves, properties of electromagnetic waves and the electromagnetic spectrum. Topic 2 discusses radiowave propagation, including components of radio waves, electromagnetic fields, and effects of the Earth's atmosphere and terrain on radio waves. Topic 3 discusses transmission line theory, including terminology, types of lines, losses, length of lines, and discussions on characteristic impedance, electromagnetic fields, line reflections, standing waves, and standing-wave ratio. Topic 4 discusses several antennas, including the Hertz, Marconi, several arrays, and special antennas. 14183.pdf - Pages: 192 - NEETS, Module 11, Microwave Principles - Presents an introduction to microwave principles. Topic 1 introduces waveguides in terms of theory and application; various waveguide devices are explained. Topic 2 describes microwave components and circuits. Microwave components, tube principles and types, the decibel measurement system, and solid-state microwave devices are covered. Topic 3 describes microwave antennas. Antenna characteristics, reflector antennas, horn radiators, lens antennas, arrays, and frequency sensitive antennas are explained. 14184.pdf - Pages: 230 - NEETS, Module 12, Modulation - Presents information on the fundamental concepts of amplitude modulation, angle and pulse modulation, and demodulation. Topic 1 describes the theory of sine-wave generation and heterodyning. Also described are continuous-wave and amplitudemodulated systems. Topic 2 describes frequency, phase, and pulse modulation. Amplitude-, time-, duration-, position-, frequency-, and code-pulse modulation are explained. Topic 3 describes demodulation theory for continuous-wave, and amplitude-, frequency-, phase-, and pulse-modulated demodulators. 14185.pdf - Pages: 218 - NEETS, Module 13, Introduction to Number Systems and Logic - Presents the fundamental concepts of number systems and logic circuits that pertain to digital equipment. Topic 1 describes unit, number, base/radix, positional notation, most- and least-significant digit, carry and borrow principles, and the decimal-, binary-, octal-, hexadecimal-, and binary-coded decimal-number systems. Techniques for converting from one system to another are covered. Topic 2 includes computer logic; AND, OR, NAND, and NOR gates; inverters; and Boolean algebra. Topic 3 presents exclusive OR and exclusive NOR circuits, adders, flip-flops, clocks, counters, registers, and logic families. 14186.pdf - Pages: 175 - NEETS, Module 14, Introduction to Microelectronics - Presents information on the fundamental concepts of microelectronics, solid-state devices, and integrated circuits. Fabrication, packaging techniques, and equivalent circuits are discussed. Topic 2 discusses the Navy's 2M program including certification requirements, levels of maintenance, repair stations, 2M facilities, high-reliability soldering techniques, and test equipment. Topic 3 covers removal/replacement/repair of miniature and microminiature components, and safety precautions. 14187.pdf - Pages: 196 - NEETS, Module 15, Principles of Synchros, Servos, and Gyros - Presents general information on synchros, servos, gyros, and related devices. Topic 1 presents the theory of operations and alignment procedures for synchros. Topic 2 discusses servo systems, schematic and block diagrams, circuit component characteristics, and the components and data flow of a typical system. Topic 3 discusses characteristics, properties, components and other factors concerning the gyroscope. Topic 4 discusses related devices and compares standard synchro system connections with IC synchro connections, explains step-transmitter and receiver operation, and compares a resolver to a transformer. 14188.pdf - Pages: 272 - NEETS, Module 16, Introduction to Test Equipment - Presents general information on the fundamental concepts of test equipment. Topic 1 covers test equipment administration and use, focusing on Navy equipment-related programs and basic procedures. Topic 2 describes various types of measurements. Topic 3 discusses the use of basic meters. Topic 4 describes operating procedures for common Navy test equipment. Topic 5 covers special application test equipment used in the electronics field. Topic 6 explains the purpose and operation of the oscilloscope and spectrum analyzer. 14189.pdf - Pages: 201 - NEETS, Module 17, Radio Frequency Communications Principles - Presents general information on the fundamental concepts of radio-frequency communications. Topic 1 introduces the types of electrical telecommunications, their modes of operations, and Navy frequency band usage. Topic 2 discusses transmitters, receivers, and their control circuitry. Topic 3 describes equipment interfacing, teletypewriter and facsimile operations, security, quality monitoring, and safety. Topic 4 addresses a basic satellite communications system, equipment characteristics, theory of operation, and applications, both present and future. Topic 5 covers the lower frequency bands usage, microwave systems, the Naval Tactical Data System, portable equipment, and laser theory and applications. 14190.pdf - Pages: 204 - NEETS, Module 18, Radar Principles - Presents general information on radar theory, equipment, and maintenance. Topic 1 introduces basic radar concepts, principles of operation, transmission methods, and common types of radar systems. Topic 2 discusses major units of a radar including synchronizers, transmitters, duplexers, and receivers. Topic 3 addresses radar indicators and antennas. Topic 4 covers transmitter and receiver performance checks, radar support systems, and safety considerations peculiar to radar operation. 14191.pdf - Pages: 156 - NEETS, Module 19, The Technician's Handbook - Provides the technician who works in the electrical and electronics fields a ready reference manual that will be of assistance during everyday work. It begins with information on mishap prevention and first aid, then covers other information useful to the technician such as commonly used formulas, data tables, general maintenance hints, and a listing of often used publications and documents. 14192.pdf - Pages: 95 - NEETS, Module 20, Master Glossary and Index - Provides a ready reference source for the NEETS student. It begins with an alphabetized master glossary of the terms used throughout the NEETS. 14193.pdf - Pages: 216 - NEETS, Module 21, Test Methods and Practices - Presents information on the fundamental concepts of test methods and practices. It is written with the junior practicing technician in mind and based on Electronics Installation and Maintenance Handbook (EIMB), TEST METHODS AND PRACTICES. There are five topics: "Basic Measurements," "Component Testing," "Quantitative Measurements," "Qualitative Measurements," and "Waveform Interpretation." 14195.pdf - Pages: 164 - NEETS, Module 23, Magnetic Recording - Introduces fundamental concepts of recording on magnetic tape and disks. Topic 1 states the prerequisites for magnetic recording and describes magnetic recording heads. Topic 2 describes types of magnetic tape, types of tape errors, causes of tape failure, methods of erasing tape, and procedures for handling tape. Topic 3 describes tape recorder heads and preventive maintenance requirements. Topic 4 describes tape transport systems, tape reeling systems, capstan speed control methods, and cleaning procedures. Topic 5 describes the function and main parts of a tape recorder's record and reproduce electronics. Topic 6 describes the seven most common magnetic tape recording specifications. Topic 7 describes the characteristics of digital magnetic tape recording. Topic 8 describes how floppy and hard disks are constructed, how data is recorded on them, and how they are handled and erased. 14196.pdf - Pages: 238 - NEETS, Module 24, Introduction to Fiber Optics - Presents general information on fiber optics and optical fibers. It encompasses the background on fiber optics; fiber optic concepts; optical fibers and cables; optical splices, connectors, and couplers; fiber optic measurement techniques; optical sources and fiber optic transmitters; optical detectors and fiber-optic receivers; and fiber optic systems.